“There are so many new rich people and there is no place for them to spend their money” said Rob, a French- American investor I met on the flight from Moscow to Ulaanbaatar (UB). He told me he was building a new club and Irish pub – “the biggest in UB” he promised. I gave a dry smile. The thought of yet another Irish pub is hard for me to get excited about because they all look the same to me. Hours later I discovered the city is already full of Irish pubs, crammed in amongst the office towers under a skyline cluttered with cranes. Up in the surrounding hills, beyond the cranes and city lights, the slums are populated by gers (traditional Mongolian tents) exhaling thick coal smoke. The khashaas (individual fenced plots) highlight the organic pattern of the informal urban fabric. 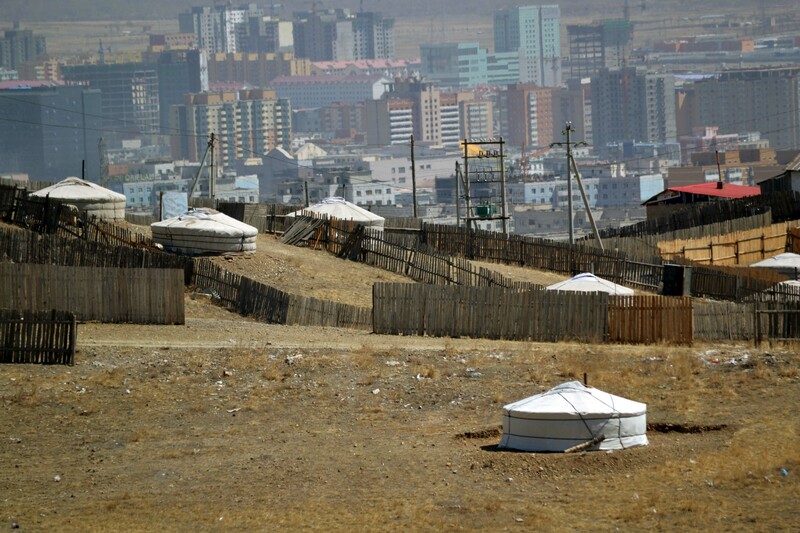 More than 50% of Ulaanbaatar’s population lives in ger-areas and around 47% of ger residents live in poverty. Ger-areas have limited infrastructure and services such as heating, water and sanitation. Residents use coal-fired stoves to survive extremely harsh winters with temperatures below -40°C. Domestic coal fires are the main cause for air pollution in Ulaanbaatar where individual households cannot afford to connect to the city’s power grid. Improving access to services would help to upgrade these areas and improve the quality of life. 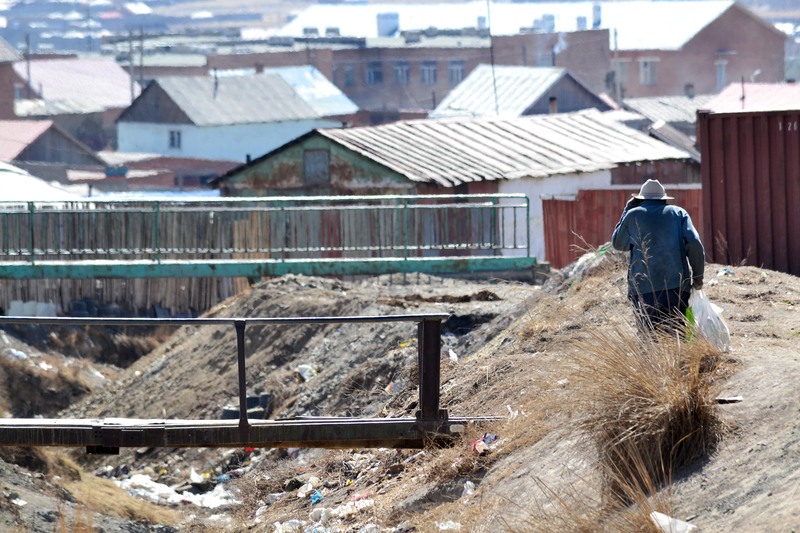 A major cause of the growth of slums in Ulaanbaatar is immigration to the city related to dzud – a concurrent natural disaster characterized by summer drought followed by particularly harsh winter with extremely low temperatures and heavy snow. The 2010 dzud affected an estimated 769,106 people (28% of total population) and has resulted in 8.4 million livestock deaths. Many were forced to move to the capital. Other causative factors for the increase of slums include high poverty levels in rural areas, the inexperience of local institutions in dealing with urban issues, natural population growth and the Free Mobility Law. This law, approved by the Supreme Court in 2003, grants every Mongolian the right to freely own a plot of land in the capital. The challenge in Ulaanbaatar is therefore a matter of land management and affordability of services and adequate housing. The extreme temperatures and the spread of slums make services difficult and expensive to implement. To address these issues, the most viable strategy is to densify ger-areas. Residents can not afford individual connections to services and grouping residents together could reduce the cost for such services. The question lies in how to implement such efforts, in particular how slum dwellers will participate in the development strategies of the city. Another important challenge is how to create a financial flux that integrates private sector, residents and government. It is important to remark there is not small effort towards slum upgrading of ger-areas, any small improvement can create a flow-on effect on service provision to the surrounding slums that continue growing. Thus, opportunities for both residents and private sector, and the city’s development future lie in the provision of adequate housing and the improvement of ger-areas. Perhaps, the creation of an entity to act as fair broker between private, residents and government can contribute to fill this gap. 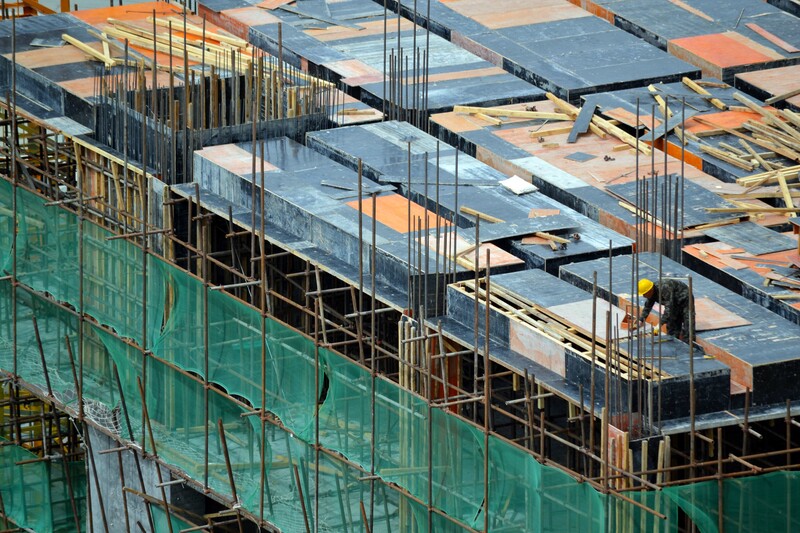 Under the support of a new created public-private entity residents could create community builders associations, or similar schemes of housing co-ops as an alternative for affordable housing construction. Residents can start a guided and progressive land pooling process, making land available for public facilities at the time they can have optimums living conditions. This process can allow to lease part of the land to the private sector and obtain in return the finance for the construction of housing buildings and improved urban spaces. Moreover, the creation of such entity can address potential future concerns such as how to work out compensation systems, how to prevent land speculation and rise in land prices after the first residents gain access to services and, more importantly, how to guarantee that residents who take part in eventual slum upgrading strategies will get fair benefits for pooling or trading their land. Additionally, this entity can stimulate private sector investments in areas that have higher profitable potential such as the land along the primary roads. 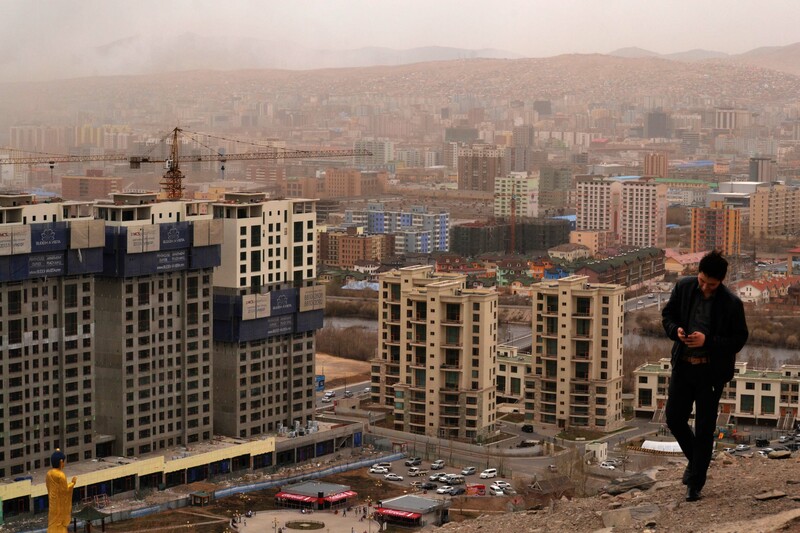 As the opportunities rise in Ulaanbaatar, the private sector is ready to push forward with urban development, the national economy is booming due to rich mining resources, and the Mayor, Bat-Uul, has outlined a vision of creating urban corridors on the model of Los Angeles’ Wilshire Boulevard in the middle of the slums. 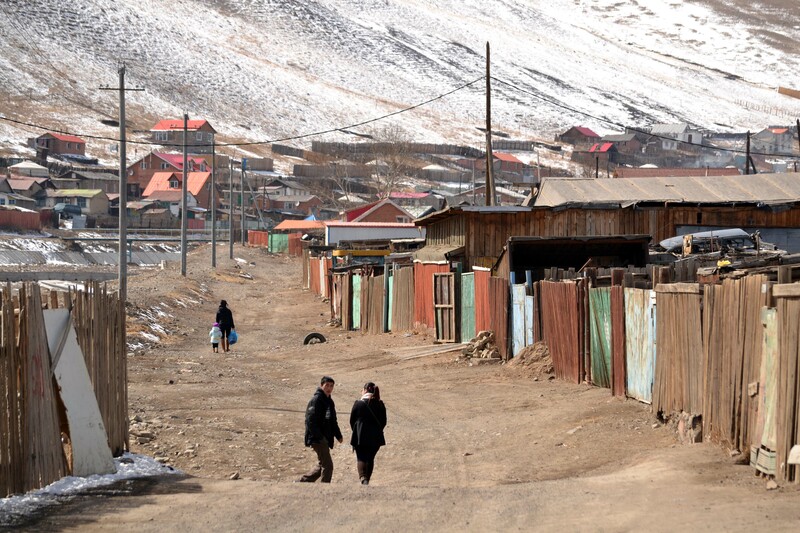 Empowered residents stand to gain through improved housing and lives will be saved from the harsh Mongolian winter while contributing to the city’s economy. Perhaps Rob, my co-passenger from the flight in, would stand to benefit also by making a wiser choice and investing in the community. 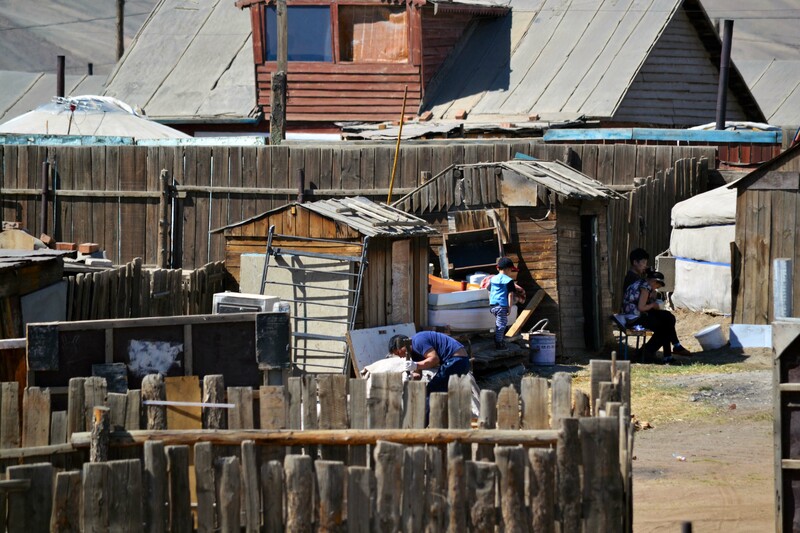 This entry was posted in AHI Activities, Geographic focus, Personal, Photos and tagged AHI, community development, Housing finance, Mongolia, slum upgrading, slums, urbanization on May 15, 2013 by ahiglobal. ecological disaster (droughts) > migration to city > creation of shantytowns and slums > crime, poverty, no education, etc. What has caused this? In my train of thoughts, I would say that monetary capitalist economy driven by greed and scarcity. The same greed as you pointed out in the beginning of your article can not solve problems of slum dwellers. They would rather construct million Irish pubs and strip clubs. People who are living without any hope of finding a good job are not interesting clients to them. There is a slight chance that the government would run programs to help them (like it did in Brazil). With the upcoming mining in Mongolia, it is probable it will have enough money to pay the corruption as well as some social development. But will it be enough? I guess not. It will end as usually – poor will stay poor and the ruling class will fly their helicopters from their mansions to the Ulaanbaatar downtown. What needs to be done is to show those people how to take care of themselves, in their community, and without any solid help from the government. I would suggest giving the opportunity to start their own housing projects that would cover educational and social purposes. My star in this field is Earthship architecture. It is built to endure extreme temperatures and it can be build fast and without a necessity to raise much money. They just need the knowhow, nothing more.